My love of family is most important in my life. A close second is my love of orthodontics. An attractive, healthy, confident "Thank You Smile" from a completed patient is my greatest reward. 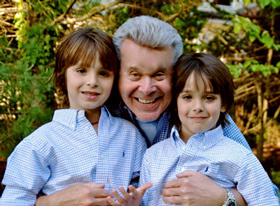 For the past 25 years, I have built my practice on providing the highest quality of orthodontic care for my patients. I have enjoyed getting to know each and every one of them and their families and hope to welcome new patients into our family for many years to come. I attended Temple University for my undergraduate degree before continuing on to Temple University School of Dentistry where I earned my Doctor of Dental Medicine degree. My Orthodontic Residency was completed at Columbia University. I continually update my education through continuing education courses and seminars throughout the year and am certified to provide Invisalign, lingual braces, and orthodontic implants. Before setting up my practice in the Monmouth and Ocean county areas, I served as a Captain in the United States Army. I was a past instructor in the Orthodontic Department at New Jersey College of Medicine and Dentistry and am an attending staff member at CentraState Medical Center. I think that staying involved in the greater dental and orthodontic communities is extremely important. I am a member of the American Association of Orthodontists, the American Dental Association, the New Jersey Dental Association, and Monmouth-Ocean County Dental Society, and the Middle Atlantic Society of Orthodontists. My free time is spent with my family and friends. When I get a chance I enjoy playing golf, jogging, reading a good book, or just relaxing at the beach. I consider giving back to my community a priority. I make donations to elementary schools' library and media centers every year and partner with the schools to foster recreational summer reading programs by rewarding outstanding students with Barnes & Noble gift certificates. 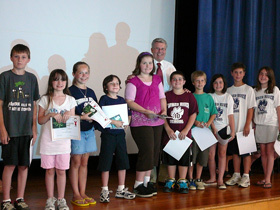 Photo: Dr Leonard Kessler with the outstanding students from the Forked River Elementary School.